The Northwestern Pacific Ocean has seen quite a number of tropical cyclones in the last two weeks and another has just formed north of Guam triggering warnings on several islands. NASA's Terra satellite provided a visible image of Tropical Depression 14W today, Aug. 23. Tropical Depression 14W developed just north of Guam and triggered a tropical storm warning from the National Weather Service (NWS) Office in Guam for Agrihan, Pagan and Alamagan Islands. NWS Guam said "South winds of 30 to 40 mph with gusts to 50 mph during heavy showers will veer to the southwest around sunrise. Winds will begin to gradually diminish this afternoon...becoming around 15 to 20 mph this evening. Rainfall of 3 to 5 inches is possible through midday Thursday, Aug. 25. Exposures but will then spread to southwest and west exposures by sunrise. Minor coastal flooding is possible. Wind waves produced by southwest winds could affect west side anchorages." 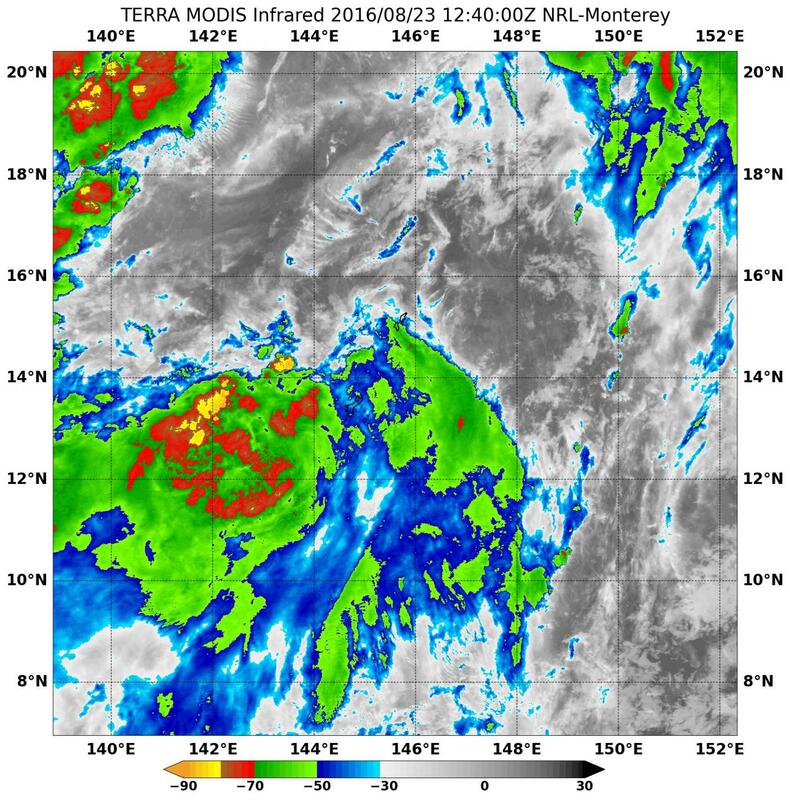 The Moderate Resolution Imaging Spectroradiometer or MODIS instrument aboard NASA's Terra satellite provided an infrared look at Tropical Depression 14W on Aug. 23 at 8:40 a.m. EDT (12:40 UTC). The MODIS image showed the coldest cloud top temperatures as cold as minus 70 degrees Fahrenheit (minus 56.6 degrees Celsius) indicating strong storms in the southern quadrant of the storm. Cloud top temperatures that cold indicate strong convection, or rapidly rising air that condenses into clouds and storms. NASA research has shown that storms with cloud tops that cold have the potential to drop heavy rainfall. At 11 a.m. EDT (1500 UTC), the center of Tropical Depression 14W (TD14W) was located near 16.4 degrees north latitude and 145.2 degrees east longitude. That's about 42 nautical miles northwest of Saipan. The depression was moving toward the north-northwest near 18.4 mph (16 knots/129.6 kph) and the storm is expected to track to the north. Maximum sustained winds are near 34.5 mph (30 knots/55.5 kph) with higher gusts. The Joint Typhoon Warning Center noted that moderate to strong upper-level vertical wind shear is preventing the development of thunderstorms in the northern quadrant of TD14W.